Villa Macy is an amazing holiday villa on the Troia peninsula south of Lisbon. Lisbon can easily be reached by ferry (approx. 40 min). Magnificent holiday villa for 10 with 5 bedrooms, 4 bathrooms, private pool, air conditioning, WiFi internet and private tennis court only 30 m. from the beach. Perfect holiday villa for families with children! 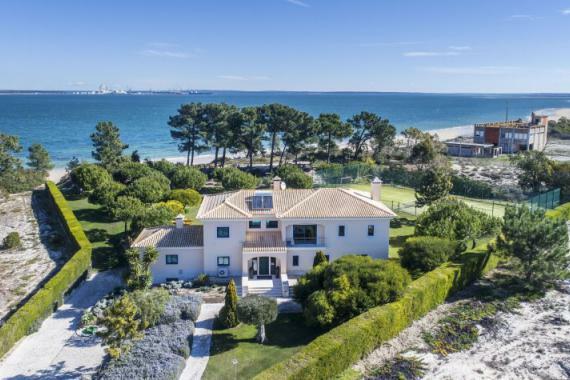 This unique holiday villa lies first line beach on the lovely peninsula Troia south of Lisbon. Lisbon can be easily reached by ferry (40 min.) or by car (1,15 hrs.). Villa macy comprises 2 floors and has its own access to the beach, that can be closed by a gate for the safety of young children. On the ground floor there is a spacious open plan living area with comfortable sofas, dining table and a fully equipped modern kitchen. Furthermore on this floor a guest toilet and a double bedroom with bathroom. The living area leads to a large covered terrace with dining table for 10 and a built-in BBQ. On the first floor there are 3 double bedrooms each with en suite bathroom and a bedroom with bunk beds for children. In the well-tended completely fenced garden lies a large private pool (12 x 5) surrounded by a wooden terrace with 10 sun beds and sun umbrellas. Villa Macy has a private tennis court! Holiday villa Macy is located first line beach on the Troia peninsula south of Lisbon. Beach: 30 m. Supermarket: 500 m. Restaurant: 500 m. Lisbon by ferry: 40 min. Lisbon airport by car: 130 km. Restaurant: 500 m. Supermarket: 100 m. Golf: 3 km.